The San Francisco Bay area is a wonderful place to find wild edibles while enjoying a casual walk along the shoreline or in the hills and meadows of the surrounding countryside. My young ones forage every day, because of their cooking which uses wild plants in most of its dishes and requires a steady supply of fresh produce. Know what’s safe and what is not. It is best to read as much as you can or follow a knowledgeable mentor before you strike out on your own. The bible for many foragers is Euell Gibbons’ s classic, Stalking the Wild Asparagus, first published nearly fifty years ago and still in print. Now there are numerous field guides, books and pamphlets as well as authoritative websites. There are also guided tours and tutorials to give the beginner some guidance. These are available in the Bay Area as well as many other cities. A good local field guide with pictures and descriptions of the local plants and where they grow is indispensable, especially when you are first beginning to forage. Your local book store will have a wide and appropriate selection for your region. Take time to compare before you select the one or ones you will take with you on your foraging walks. Don’t forage on private property without permission. Often, it is easy to obtain permission from land owners to forage what they believe to be noxious weeds or invasive pests. But ask them first, and be sure to explain what you are doing. Be aware of potentially hazardous places like landfills or shifting terrain. Plants, whether they are wild or domesticated, can incorporate toxic substances from the ground in which they grow. Landfills may be contaminated years after they have grown over. It may be tempting to forage a choice specimen from an unstable or steep hillside. In those cases, the forager may risk injury or even death in an unexpected landslide. Don’t dig up anything. A cardinal principle of foraging is sustainability of the environment. While a particular root or tuber may be tempting, digging may disrupt the environment enough that future growth cannot be sustained. Avoid foraging near the road. Although the plants are often luxuriant and the foraging is easy, fumes and other potentially toxic materials from passing autos could taint your harvest. It’s ok to keep your favorite places secret. Every forager knows what he or she is looking for, and with experience will learn the ideal places to find those treasures. You are not obliged to tell others where you found a particular plant, especially if it is uncommon. Again, sustainability should be a consideration. If someone shares a secret spot with you it becomes your shared secret. it’s not ok to tell others. Sometimes an especially good friend will let you in on a particularly choice spot to find a particular edible. Just remember that at that point, your friend’s secret becomes your shared secret. Violation of this rule is a guaranteed way to lose a good friend. Know what’s in season and where it grows. It should go without saying that it is a fool’s errand to hunt for fir tips along the beach or to look for sea beans on a mountain trail. Knowing the patterns of the seasons is just as important. Textbooks, field guides, web sites, and guided tours are essential to learn these variations. Below is a brief list of some of the edibles Sarah and Evan have collected over the time that they have been about this. The actual list of all locally available edible wild plants is much longer. How you develop your own foraging list will depend upon how you want to use the plants, how much time you have to devote to the activity, where you live, and how accessible the mountains, trails, fields, and shores are to you. Dandelion is known by nearly everyone by its bright yellow flowers that brighten lawns and the cliff meadows along the ocean. The tender green leaves should be harvested early in the season because they become more bitter as the season goes on. Collect only the youngest leaves and use them in salads or treat them like spinach. 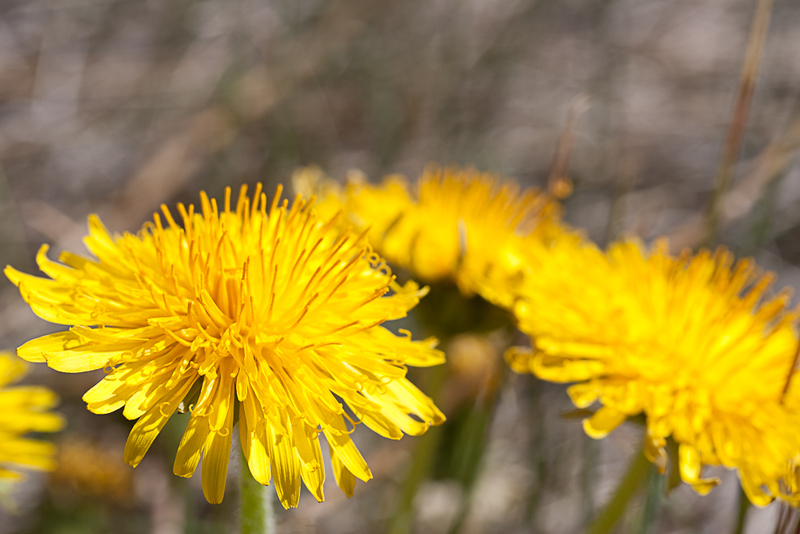 This is nothing like the big, coarse dandelions that you often see in supermarkets. Wild radish is widespread throughout the region, growing in disturbed soil along the roadside or in neglected fields and orchards. Foragers go after the attractive flowers of white to pink to purple which are most visible from April to July. The four-petal flowers add a peppery taste to salads or an attractive garnish to other dishes. 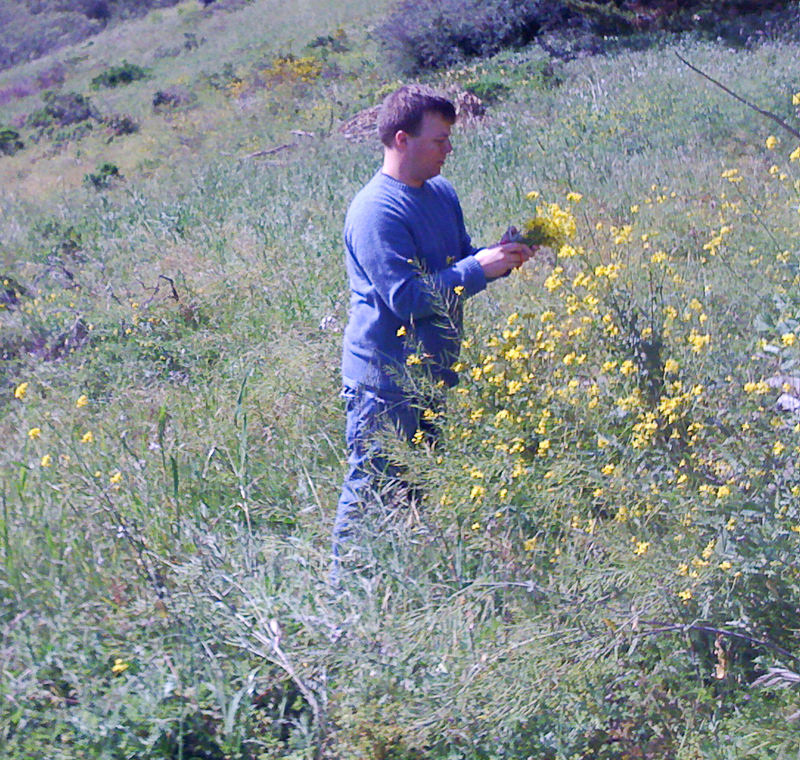 Wild mustard is also widespread, and there are many varieties found throughout Northern California. The most common is black mustard. The flowers make a beautiful addition to a salad or as a highlight to other plates. The greens, especially when young, can be used in a salad or as a potherb. Wild fennel grows abundantly along Northern California roadsides, in neglected fields, and open patches all the way down to the beaches. It is different from the fennel that you find in grocery stores and farmers markets because it has no bulb. In the spring, the green fronds can be harvested and chopped for garnish, seasoning for roasted meats, or salads. It can also be cooked as a potherb. In mid-summer when the flowers are in bloom, the pollen can be gathered to sprinkle as a seasoning or incorporated into pasta, pastries and breads, or sauces. Later, the seeds can be eaten raw or used, whether whole or ground, as an anise-like seasoning for sauces, soups, roasted meats, or sweets. Sea beans, also known by a number of other common names including sea asparagus, sea pickle, pickleweed, and glasswort are not beans at all, but their bright green color, thick stem and no leaves produce an appearance similar to green beans. They are often found in clumps in tidal areas near beaches. They have a crunchy, salty flavor and can be eaten raw in salads or cooked in numerous ways. . Their vivid green stalks, which grow on salt marshes and beaches, have a crunchy texture and a briny flavor with a vegetal aftertaste that’s been likened to asparagus. They are found year around, but best from the early spring to fall. Douglas fir is a tree that grows in the transition zone between the lower junipers and pines and the higher alpine firs and pines. Douglas firs are common along the hiking trails in the mountains of the Bay Area. In spring, as with other conifers, the Douglas fir branches send out tips of new growth. These tips can be harvested in the early spring when they are particularly tender and aromatic. Although they can be used as domestic herbs might be used, they are most commonly used to infuse a woodsy essence to spirits, mixed drinks, teas, and oils. They make an aromatic rub for roasted meats as well. Asparagus is not really wild at all, but it is distributed widely because cultivated asparagus seeds are easily spread by hungry birds and wind currents. Asparagus can be found in many disturbed areas, especially fence lines where there is sandy, moist, but well-drained soil. Like its domestic counterpart, it is best harvested in the spring and early summer. 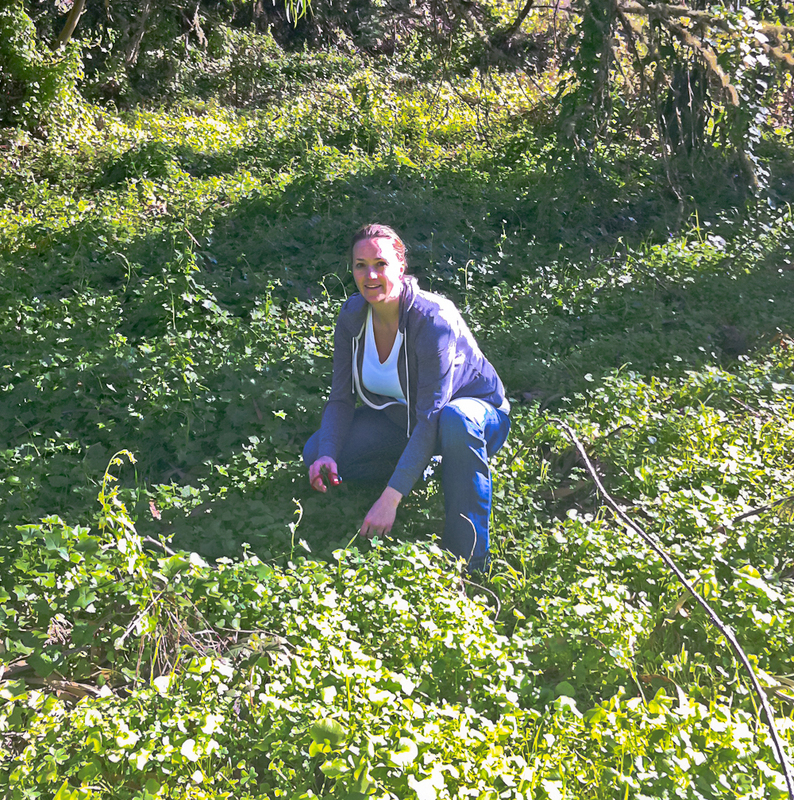 Wood Sorrel grows throughout the region and can be harvested spring through autumn. The lance-shaped leaves are good in salads and the classic sorrel soup, but can also be used as a potherb. The rather sharp, acid taste is due to a high content of oxalic acid which in large amounts can cause abdominal pain. Long-term heavy ingestion can even cause kidney stones. Moderate amounts are totally safe, and there are no poisonous look-alikes. Miner’s lettuce grows in moist areas of lower terrain and mountain slopes throughout the Northwest and most of California. Best harvested in the spring when the leaves are young, it can be harvested in the summer and autumn, too. Use the leaves and flowers in salads or as garnish for other foods. Purslane, also called Portulaca, grows at all elevations. Gardeners consider it a pest, and it is found in all sorts of disturbed soils. It is best in the spring, but can be harvested all year along the coast if you are careful to select the youngest, most tender shoots. That method allows you to harvest the same planting all season long. Much more flavorful than that found at farmers markets, it can be used in salads or boiled as a potherb. Stinging nettle is widespread in moist, disturbed soil along stream beds, mountain trails, the forest edge, or vacant lots. Best harvested late in the fall or in the spring when the leaves are tender, the plant has tiny hairs which contain formic acid and histamine. For this reason, use gloves and a long-sleeved shirt when you harvest, and inactivate the toxins with steaming, boiling, or otherwise heating. Nettle soup is famous. Statewide Integrated Pest Management Program University of California IPM Online. http://www.cal-ipc.org/ip/inventory/weedlist.php – a terrific online resource with excellent pictures of plants that are considered invasive, many of which are edible and perfect for foraging. 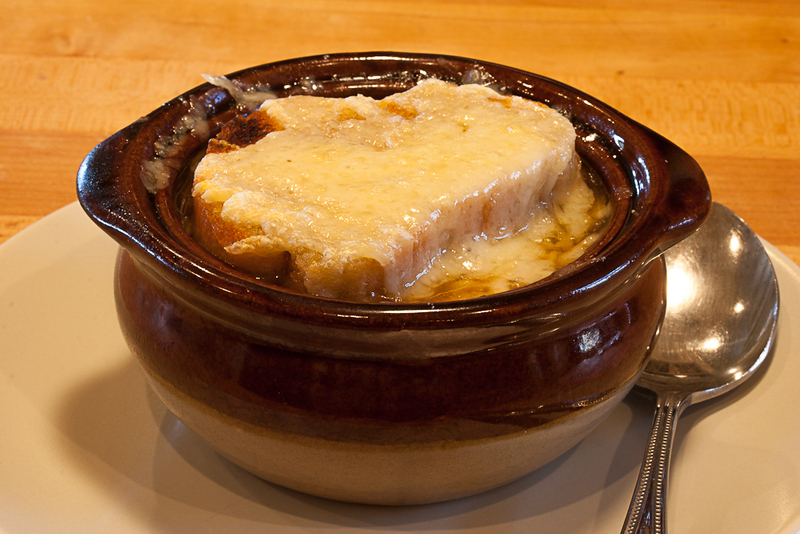 Who doesn’t like onion soup? My older daughter for one. She actually doesn’t like anything with onions. 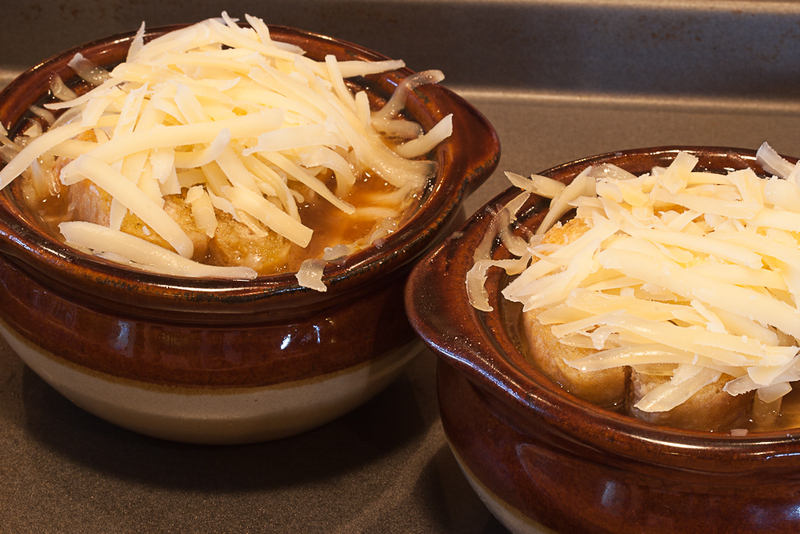 I can’t understand her taste, because for me a well-made bowl of onion soup topped with a crisp round of garlic crouton and melted Gruyère cheese approaches the perfect simple evening meal. The problem is that there is many a bowl of not-well-made soup. The dehydrated variety doesn’t even really qualify as soup, and the canned sort is not much better. Sometimes you see a version of onion soup in the steam table on a buffet line. That, too, is usually not very appealing. And all of this is too bad because the real thing is so easy to make. Julia Child showed Americans how to make a good soup, along with a lot of her other revelations on good cooking. From time to time we still watch Julia making soup on a black-and-white DVD of her early shows I got as a gift from my children many years ago. I also check out her classic recipe in our tattered, disintegrating copy of Volume One of “Mastering the Art of French Cooking” (pages 43-45). As is always the case, Julia took no shortcuts, and her instructions can sometimes appear daunting. 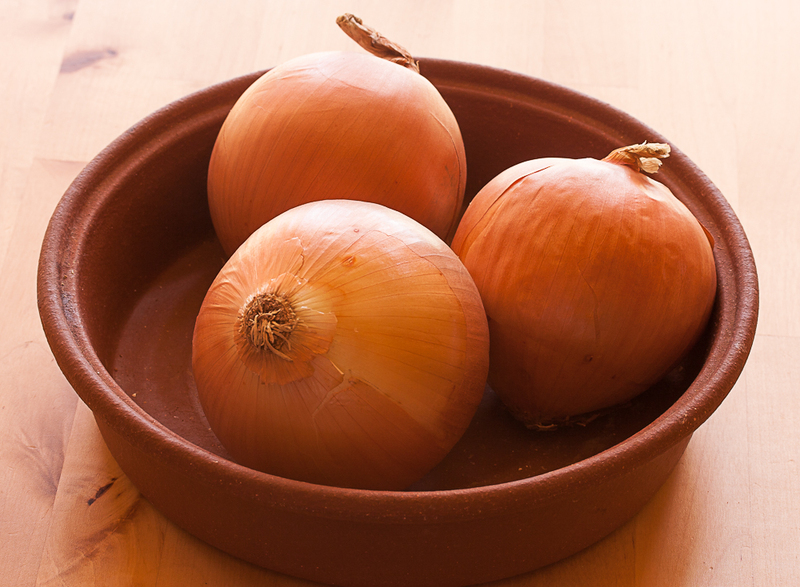 Those may be the reasons that onion soup is not a mainstay of most kitchens. Another reason may be that the soup is viewed by modern cooks as a bit old-fashioned. I say too bad to that! The final reason may be that many, like my daughter, don’t like onions. That remains a mystery to me. The version that follows is a riff on Julia Child’s recipe, but I have tried to simplify preparation a bit so that you can whip up soup in the afternoon for dinner in the evening. Add some crusty French bread and fresh butter along with a bottle of chilled dry white wine, and you have everything you need for a relaxing evening at home. Heat the olive oil over medium heat in a heavy-bottomed 4-quart saucepan with lid. Add the onions and salt. Stir and cover to sweat the onions. Be careful not to let them burn. 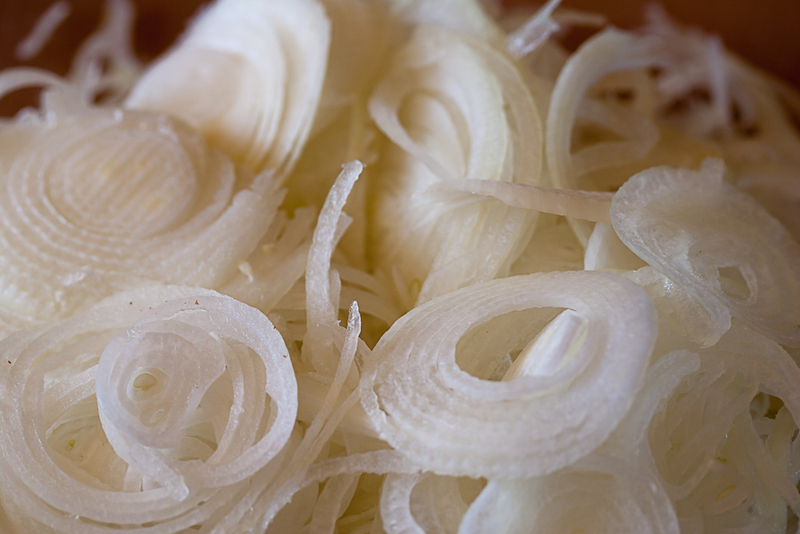 When the onions are translucent and soft, remove the lid, turn up the heat to medium-high, and stir in the sugar. 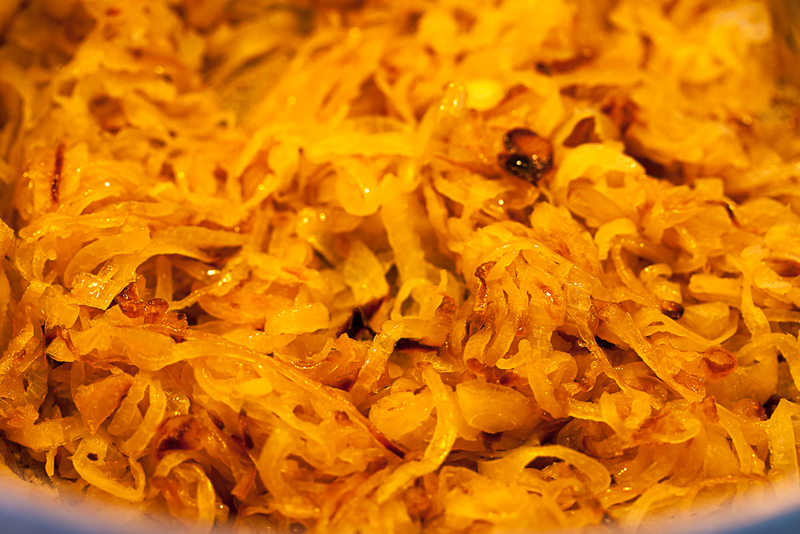 Stirring frequently with a wooden spoon, caramelize the onions until they are golden brown. They will not begin to brown until most of the liquid has boiled off. Be very careful not to let the onions burn. When you are satisfied with the color of the onions, add the flour, stirring until the onions are completely coated. Cook a few minutes so that the flou loses its raw taste. Add the beef stock and vermouth; adjust the seasoning with salt and pepper. Stir well. 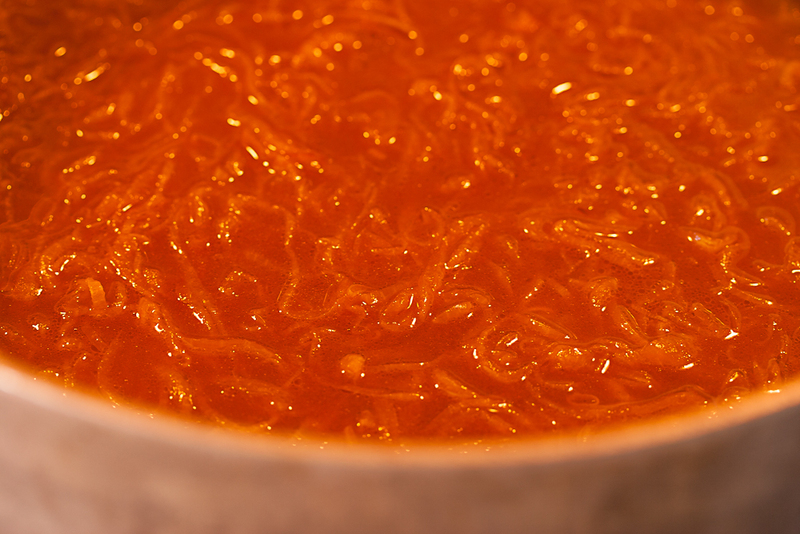 Cover and turn the heat to simmer so that the mixture just barely bubbles every few seconds. Simmer for at least two hours. While the soup is simmering, prepare the croutons by placing the baguette slices on a sheet pan in an oven preheated to 200°. Bake until the bread has dried out a bit. Then remove from the oven and scrape the cut garlic over both sides of the bread slices. Return to the oven and continue to bake until the bread has completely dried and turned a light brown color. Remove from the oven, cool the croutons, and set aside. When your soup has simmered long enough, ladle it into four oven-proof soup bowls. Top each bowl with a garlic crouton and cover with the grated cheese. Place the bowls on a sheet pan and slide under a pre-heated broiler for just a few minutes until the cheese is melted and – if you prefer – lightly browned. Is it soup yet? Definitely! Serves two if you’re really hungry or four if you would rather enjoy the wine.